Flemington trainer Danny O'Brien had a frustrating day on his home track on Saturday as he filled the runner-up stall three times for the afternoon. "All our horse have put in terrific performances, but unfortunately they all found on better," O'Brien lamented. "A little bit of luck here and there and we come away with a treble, there is not much between victory and defeat, but there is a far bigger gap in the emotions you feel after a day like this". Second Bullet, who was shooting for his third straight Flemington win, was nosed out in a head-bobber by Tashbeeh early in the day. "Second Bullet was very unlucky. He was in front a stride before the post and after, but on the line he has been nosed out. He is in super form and we will keep him going while he is in such strong form," O'Brien said. In the feature race of the day the listed Kensington Stakes, it took potential star three-year-old Headwater all his might to defeat Bullpit down the straight (pictured above). 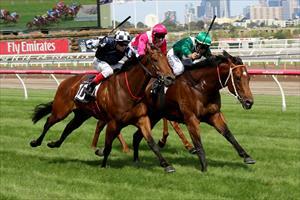 "Bullpit's past two runs down the straight have been excellent and he is in great form. It took a really nice horse to beat him and this performance showed he is up to black-type company." Evergreen galloper The New Boy was run down late by Dan Zephyr, with the margin to the third horse a further 3.5-lenghts. The second placing was the gelding's 18th career placing in town. "He is a stable favourite as he is just so honest. His form this campaign has been excellent and he is knocking on the door for another metro win."